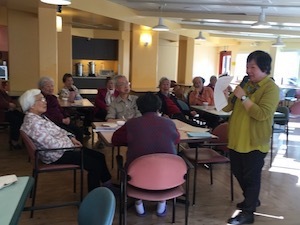 In March, Consumer Action partnered with Woolf House, an affordable senior rental housing community in San Francisco, to conduct two elder fraud presentations (in both English and Chinese) for community residents and case managers. Everyone must be on guard against scams, but seniors are often especially vulnerable. Many crooks—and even friends and family members—take advantage of the good nature of seniors to cheat them. According to a 2011 report by MetLife, victims of elder financial abuse suffer an estimated $2.9 billion in losses annually. Consumer Action staff have partnered with Woolf House several times over the years to provide consumer education to community residents. This time, Consumer Action Associate Director of Outreach & Training Audrey Perrott conducted the English presentation, while Community Outreach Manager Jamie Woo did so in Chinese. Over 40 residents and two case managers attended the presentations. 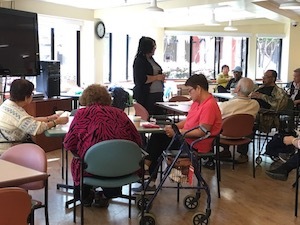 “We appreciate the ongoing opportunities to partner with Woolf House to deliver these critical educational services to their residents,” Perrott said. Attendees left the presentation with an arsenal of information to protect against elder fraud and report any abuse to the appropriate authorities. Consumer Action partners with its nearly 7,000 network partners to educate consumers across the country and empower them to prosper financially. Core products and services include multilingual consumer education publications for underrepresented consumers; train-the-trainer events in-person and online; ongoing support of network partners; and much more.